Wyoming Prosperity: What If We Did As North Dakota? 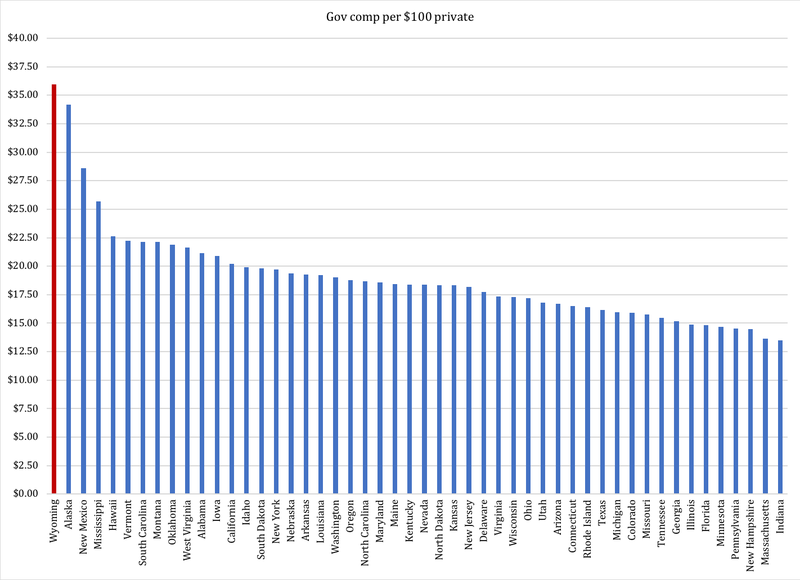 Why does North Dakota only need half the state and local government payroll that we have? This article is not going to answer that question, but we are going to assume that the good folks up there have figured out something we have not. Based on that assumption, we are going to take a quick look at how we could transform the Wyoming economy just by following their example. 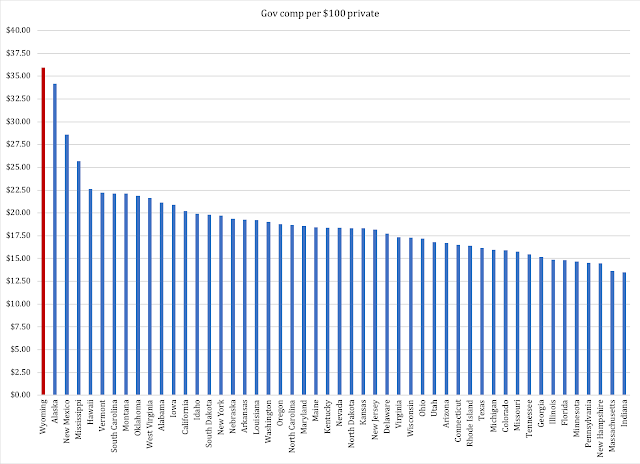 This ratio between government and private-sector earnings was the the worst in the country. The U.S. average was less than half of ours at 17.7 percent. The national average fell from $17.70 per $100 earned in the private sector in 2016, to $17.55 last year. Our "government payroll tax" remains more than twice as high as for the rest of the country. And right here, is where it gets interesting. In total, we spent $4.3 billion in 2017 on paying state and local government workers. If we had paid them at the same parity vs. private-sector earnings as in Alaska, the bill for Wyoming taxpayers would have been $216.3 million lower. At the same parity as Mississippi, we the taxpayers of Wyoming would have saved over $1.2 billion in 2017. This is money that would predominantly have been spent in the local economies around the state, and replenished savings accounts in local banks. Once we get to Arkansas, taxpayer savings reach $2 billion; at the national average those savings would exceed $2.2 billion. These are some staggering numbers, and they are not just hypothetical constructs. This is money that can help transform our economy in a way that - frustratingly - very few of our elected officials seem to be willing to understand or appreciate. To see the tangible side of this pile of cash, let us take the experiment one step further. First, though, a note of caution: a reduction in government payroll equivalent to these numbers would not result in a dollar-for-dollar increase in cash in the hands of Wyoming taxpayers. The savings would still be substantial, as would the positive effects on the Wyoming economy. Here is what this could look like. then we the taxpayers in Wyoming would realize gross, permanent savings of $2.1 billion. We now deduct a net cost for permanently closing the state budget deficit, reasonably $400 million. This takes us down to $1.7 billion, from which we deduct a standard federal-funds contribution to government. The actual federal contribution to a government worker's salary and benefits depends on how that very position is accounted for in the government system (between general, federal and other funds). A convenient proxy is the 25 percent federal funds in total state spending; assuming that one quarter of the $1.7 billion goes back to Washington in the form of reduced need for federal aid, we still have $1,287,000,000 that can be returned to Wyoming taxpayers. Through cuts in property and fuel taxes, logistics companies along the I-80 corridor would be encouraged to stay in Wyoming and expand their operations. Property tax cuts, together with reductions in sales taxes, would also make life a bit easier for tens of thousands of financially strained families around our state. If we assume that the almost $1.3 billion in remaining savings from the reduction in government is fed back into the Wyoming economy through business investments and consumer spending, we could expect it to generate another $1 billion over the course of a regular multiplier cycle (in theory 2-6 quarters, in practice probably 2-3 years). This means massive jobs creation, new entrepreneurial opportunities and a substantially improved job-market outlook for hard workers to make more money and feed bigger, happier families. A thriving private sector growing at five percent per year - which is the rate we could be looking at here - would more than compensate for the jobs cut from government. We would have stronger local communities, less need for government assistance, no more need for either ENDOW or WyoFlot, and we would build a better future for our kids from the ground up. All it takes is grassroots courage and political leadership.